MMM! | Finally, an Italian Market! Life without an Italian Market, is a life not worth living! It’s been nearly 2 years. 2 years without the joy of having immediate access to fine Italian delectables. Paper-thin salty prosciutto, milky fresh mozzarella, spicy “gabagool” (capicola) and guilt-ridden mortadella with pistachios. Mama Mia!!! I could go on FOR-EV-ER! It’s sick, the amount of pure and utter pleasure I find from smoked meats (and don’t be gross!). Sweet baby Jesus answered our prayers and alerted us to Laurenzo’s Italian Market in North Miami Beach. 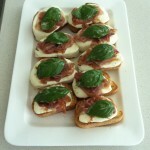 For all of you Italians/Italian-Americans in South Florida, fret no more….this is your spot! Maybe check it out this weekend? We drove 30 minutes in Tony’s HOT. AS. HELL. car without air conditioning, obnoxiously singing to the soundtrack of In the Heights the Musical, just to keep our minds off the fact that our flesh was melting off. But when we got there….GLORY! Skip the Laurenzo’s Produce Market. There is not much there that you can’t find elsewhere. Head directly to the market with the deli and plan to stay for hours. We did. Literally prancing through the aisles, with devilish grins on our faces, we terrorized this poor place. We purchased roughly 10 gallons of olive oil, 6 pounds of really fun artisan pasta, a pound of fresh mozzarella, mortadella and prosciutto, fresh baguettes, calamari… ok, I could go on forever, but you would just think I was disgusting. Tony even found a bottle of wine, “Castranova” that was the same as his grandma’s maiden name, so of course, a couple of bottles of that were added. We heard the workers speaking Italian, heard the butcher screaming over to the seafood guy who was bantering with the market guy. It was pure bliss and it just felt so right. Not pretentious. A real “family” feel. We grabbed a deli sandwich to share and some fried smelts and calamari. Seriously, who has smelts?! It was like being home for the Christmas Seven Fish Dinner (what the hell is that? Well, that’s an entirely different post, but this site is pretty funny and video might give you a flavor for what it is for Italian-Americans). Thank you, Laurenzo’s Italian Market for lighting up our lives and also providing the ingredients for us to make this glorious meal. The Details: We toasted the bruschetta, then rubbed garlic cloves over it, added the fresh mozz and put it under the broiler for a second. Then, added the prosciutto—it will melt right on to the mozz, but not dry out in doing it this way. 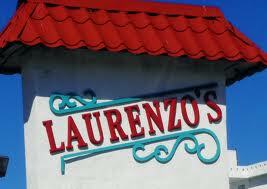 The tomato pasta was house-made at Laurenzo’s and the rest of the sauce was a one-pan creation. Would You Eat It Again? Bruschetta, definitely. 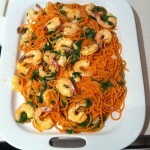 Pasta, maybe with some tweaks. What Would You Change? While we loved the “idea” of the tomato-flavored pasta, it wasn’t what we were hoping for. I think the texture was a little gummy and the flavor wasn’t intense enough. Also, from a visual standpoint, it was “off”, because the spaghetti sort of looked like carrots, creating a disconnect between what you were seeing and what you were tasting. Next time, I’d probably opt for a traditional non-flavored pasta and throw in some tomatoes instead. 2 Responses to MMM! | Finally, an Italian Market! You have no idea how happy this post just made me. This requires a feast when I return. I’m looking for good recipes as I type! ps. that bruschetta and pasta look delicious. Leave a Reply to Vince Click here to cancel reply.